With so much streaming music flying all over the place, how can a listener find the stuff that's right for them? 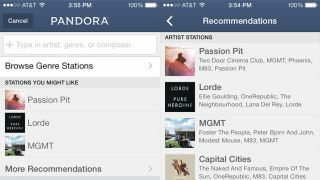 Pandora may have the answer, at least for smartphone and tablet owners. It announced today the addition of personalized music recommendations on its iOS and Android apps, which serve up to six suggested artist stations based on what the user is currently listening to. The feature can be found on the Create a Station screen as well as at the bottom of a Station List, and keeps in mind which content you have given a thumbs up or thumbs down before offering suggestions. To kick things off, Pandora will deliver personalized artist station recommendations, but plans to "evolve and refine" the feature as time goes on, promising it will improve the more listeners engage with the service. Since launching in 2005, Pandora has collected more than 35 billion bits of "thumb feedback" from users, making the service "uniquely positioned to deliver the perfect balance of familiarity, discovery, relevance and repetition for each individual listener," according to Chief Scientist Eric Bieschke. In the last month alone, Pandora served up 1.58 million hours of music to more than 76.2 million listeners - a staggering amount of content users have to weed through in search of favorites old and new. With in-app personalized recommendations now in place, listeners can tap to see a list of Artist Stations from the "More Recommendations" option, which is refreshed with updated content whenever a new station is created or deleted. Break yourself off a piece of that Android 4.4 KitKat in our extensive review!